On 4 September 2015, magistrates’ court No. 423 in Moscow’s Tver district ruled that the Memorial Human Rights Centre (Moscow) must pay 600,000 roubles (!) for refusing to apply the label ‘foreign agent’ to materials that were placed on the website of another organization, a correspondent for Kasparov.Ru reported from the courtroom. Judge Sergei Komlev found Memorial Human Rights Centre (Moscow) guilty of an administrative violation under Article 19.34, Section 2, of the Administrative Code for disseminating materials without the ‘foreign agent’ label. The paradox is that the complaint drawn up by Roskomnadzor, in essence, indicates that the human rights defenders did not put the ‘foreign agent’ label on materials published by another organizations and concerning events organized by others. On 30th June the Memorial Human Rights Centre received a warning from the Ministry of Justice that, in not using the descriptor ‘foreign agent’ on two of its documents, '11 June, Report by Kirill Velikanov, and Discussion' and 'Society can regenerate itself,' it had infringed the law on non-profit organizations. As the representatives of Memorial Human Rights Centre explained, both these documents were placed on the website of the International Memorial Historical, Educational, Human Rights and Charitable Society, prepared by staff of the International Society, and included under events organized by the International Society (as an organization). No one from the Memorial Human Rights Centre, either as a representative or in an individual capacity, participated in these events. As the senior lawyer acting for Memorial, Kirill Koroteev, explained: ‘Although these organizations occupy one premises and collaborate with one another, they have, however, different statutes and dates of registration in the register of legal entities.’ Kirill Koroteev also stressed that Memorial Human Rights Centre and International Memorial Society are different organizations. At the same time, Kirill Koroteev pointed out, if various materials are published on a single website, this fact does not mean that they are being disseminated by the same organization. The human rights defenders asked the court to dismiss the case against them. ‘We don’t refuse to take responsibility for our actions, but they are forcing us to take decisions and take responsibility for another legal entity. This is complete nonsense. We are taking part in a farce,’ Aleksandr Cherkasov stressed. Immediately after the first prosecution, a second case against Memorial Human Rights Centre was brought. This concerned a second complaint relating to a second publication belonging to another organization that Memorial Human Rights Centre did not label, the human rights defenders point out. 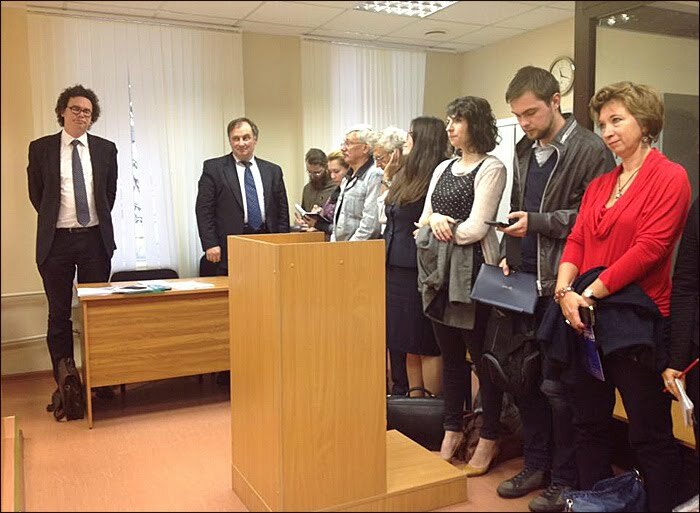 ‘Since all our requests related to the second administrative case against us were rejected, our lawyer Kirill Koroteev declared that the principle of equality of arms has been violated. The judge had taken on himself the role of the prosecution by not allowing the officials who had drawn up the official complaint to be summoned to the court, and therefore ceased to act in the role of a judge. Kirill Koroteev asked for the judge to be recused. The judge thought this over in his retiring room and decided that he would not recuse himself,’ Memorial Human Rights Centre reported on Facebook. The judge also fined Memorial Human Rights Centre in relation to the second administrative case – imposing a second fine of 300,000 roubles. As a result in one, if the expression may be allowed, ‘day of judgment’, the human rights defenders were fined 600,000 roubles for two publications, neither of which was theirs. Russian NGOs have regularly expressed their disagreement with the law and have brought an application against it to the European Court of Human Rights. The human rights defenders stress that the law is clearly discriminatory in nature and has extremely negative historical connotations.